A. V. Herzberg is an indie author who specializes in fantasy and literary fiction. She is currently working on her debut novella, "What Lives Beneath," which will be available May, 2017. 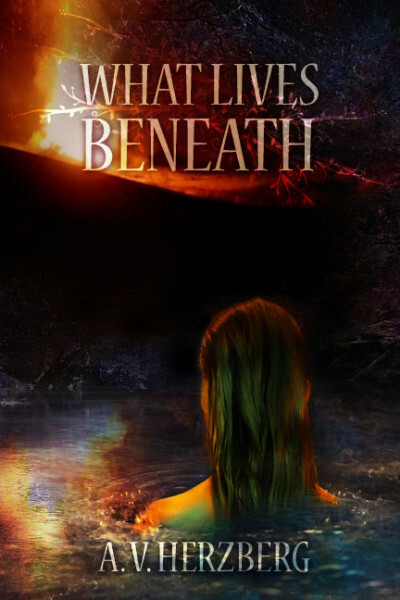 Start Reading "What Lives Beneath" Now! On the distant hilltop, a sacrificial fire blazed, its lambent flames interrupted by dark, wildly dancing figures that leapt in the air and twirled about with loud yips and shouts. Unnoticed, she stared fixedly at the scene from the shadows of the lowland. And though she could not see the one whom she most yearned for, the sensation of that one’s presence was like a strangling reed, like the dank chill of suffocating pond water. The darkness around her was close, asphyxiating. More so by the water and in the reeds where the frogs lay silent and still. The shadowed land made the flames appear all the brighter and the laughter echo all the louder as it came bouncing off the hills and down to her abode. The sounds were like stinging nettles to her ears. Stinging and burning, unpleasant and hateful. Her hands, sunk deep into the cold, slimy mud of the lake, clenched spasmodically; her nostrils flared. The acrid scents of smoke, burning flesh, and the fresh metallic blood of slain livestock were little better. None of it soothed the clenching emptiness in her middle. None of it slowed the wildness of her breathing. None of it warmed the unbearable chill that radiated through every last fiber of her being. No. None of it could. Not when he was still there. Still here. Still on that hill so close. So close. So close and unreachable. Time passed. The fires died as the whole world became that ghostly silver that appears just before morning truly dawns. A young couple made their way down the hill. Drunk and holding onto each other, they laughed at every stumble. They had forgotten their fears. Forgotten their sadness. In that moment, they were happy, oblivious to all but each other. It wasn’t right. Frozen in place, Mir stared wide-eyed at his foot and the axe. His sweat-soaked tunic felt suddenly chill, as if it were forcing the warmth from his very core. He couldn’t breathe. Dimly, he became aware of a tremble in his hands that quickly spread to the rest of his body. “Mir.” The voice called again. The sound brought Mir back. With a ragged, sucking sound, he took in a huge breath as he stumbled quickly away from the axe. He stopped. Closing his eyes, he slowly, deliberately, breathed out through his nose. He took another deep breath and let it out, expelling the lingering tremors. When he opened his eyes, it was to level a burning glare of cold fury at the all too familiar figure who had come to stand near the haphazardly stacked wood that leaned against Mir’s small, thatch-roofed hut. Lubov, the fisherman’s son, looked back with wide eyes and a look of purely oblivious innocence. “What?” Lubov asked. It shouldn’t be that way. They could not be like that. Not in front of her. Not ever. Never never never! No! How dare they! How dare they! How dare they be! With a loud crack, sharp iron tore into raw wood. The split halves of the log clanked onto a growing pile of lumber that had already met the same fate. A pause. And again the swinging axe cut through the air. The worn handle of the axe slid smoothly through his leading hand with each swing. There was a sharp, nagging pain in his right wrist that only became more aggravated with every piece of firewood he added to the pile. An ache was spreading across his lower back. Sweat dripped down his spine, cooled slightly by the swift breeze and the reaching shadows of the forest which loomed close to his hut like a malevolent neighbor. His shoulders burned. Yet, there was a certain rhythm to the work. He found a systematic measure between the swish of the falling axe, the sharp report of the strike, and the clinking tumble of the hardwood. The small gratification he gained from the rhythm was poor compensation for the work, true, but it at least it gave him something more pleasant to concentrate on than the growing aches in his body, or time the task was taking from him. Time indeed. Measure and time were intertwining to create the rhythm, much like a melody. Yes. He set another piece of firewood on the cutting stump. There was an easing in his chest at the thought, and he felt a small smile relax the muscles in his jaw. He brought the axe round again, his arms and back knotting and tensing with the power of the swing. “Mir!” Came a sudden shout. The swinging axe missed its target, sped past the cutting block, and cut deeply into the dirt a hairs breadth from the wood splitter’s booted foot. Get occasional updates about new A. V. Herzberg books, special offers, and more! A good story will transport you to another place, another time, another existence. If the author finds it difficult to lose herself within the world she has created, how can she expect others to do so? "Thoughts on Writing—A Personal Journal"